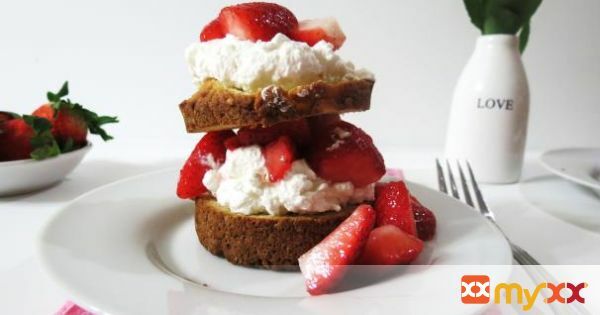 An easy, romantic, classic dessert that is full of fresh strawberries and homemade whip cream, all on top of a crumbly little cake. 1. Stir together berries and 1 Tbsp. sugar, aset aside. 2. For the shortbread: Stir together 2 Tbsp. sugar, flour and baking powder. 3. Cut in margarine till mixture resembles coarse crumbs. 4. Combine egg and milk, add all at once to dry ingredients. Stir till just moisten. 5. Spread into a greased 4 – 6oz ramekins, building up the edge slightly. 6. Bake for 10 – 13 minutes or till toothpick inserted near center comes out clean. 7. Cool in pan for 10 minutes. Remove from pan, split into 2 layers. 9. In a small bowl, mix cream, sugar and vanilla extract, beat until a heavy cream, about 5 minutes. 10. Spoon the fruit and whipped cream between layers and over top. Serve immediately. 11. NOTE: If you double the recipe, you can use an 8″ round cake pan and cook for 20 – 30 minutes. It’s so pretty when you have a full size cake.